This bell was cast in Frederick on April 1 and 2, 2006, with public participation and great festivity. Frederick County "Honey Bee" participants in grades 3-5 helped cast the bell by passing ingots of metal to furnace workers to be melted. While preparing the bell mold, artisans gave meticulous attention to the Frederick County seal. 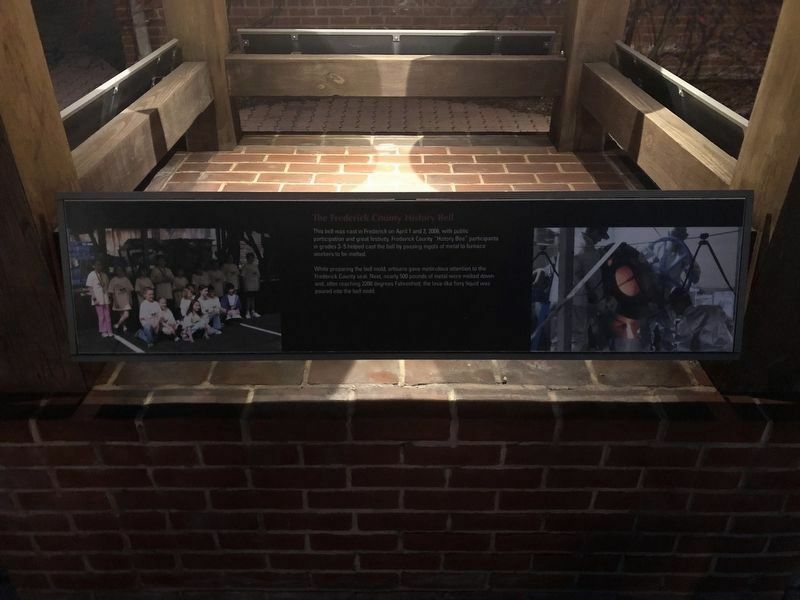 Next, nearly 500 pounds of metal were melted down and, after reaching 2200 degrees Fahrenheit, the lava-like fiery liquid was poured into the bell mold. 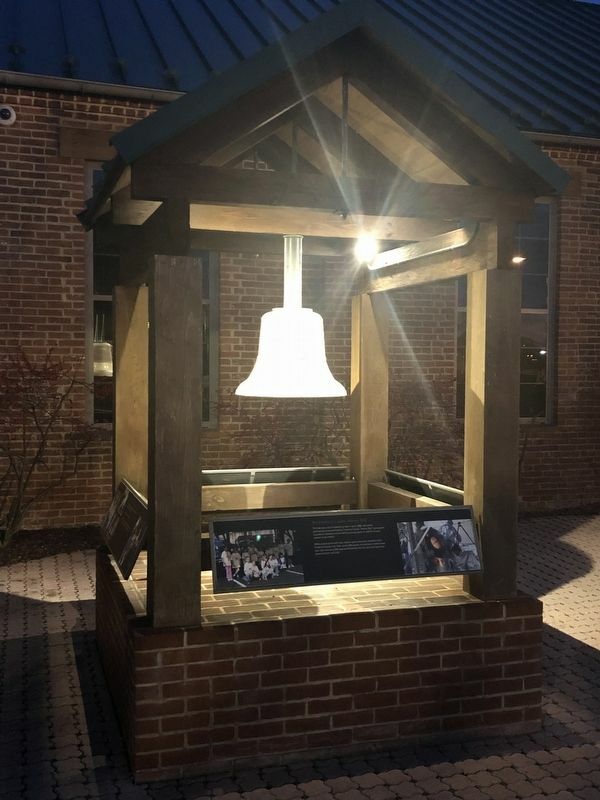 The Frederick County History Bell is the most recent addition to a collection of community instruments that have rung for more than two centuries. 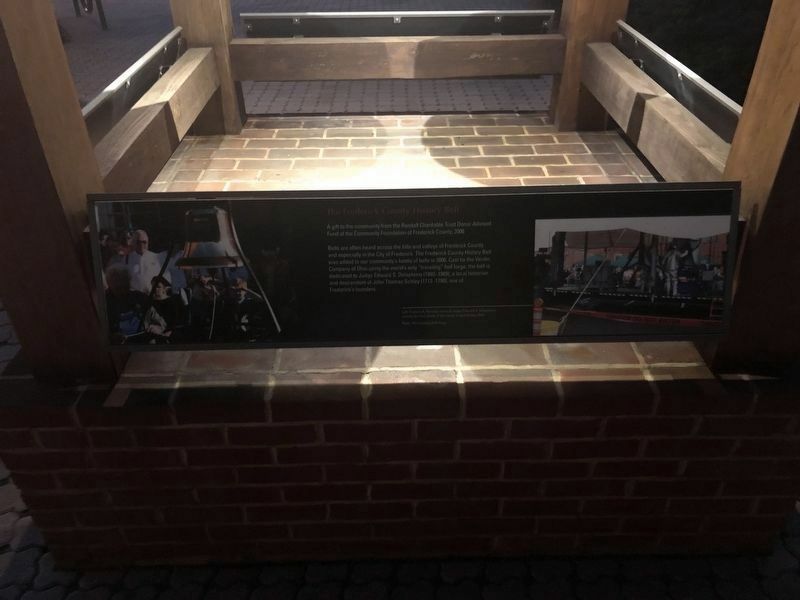 Historically, local bells have sounded the time on the quarter hour, proclaimed funerals and weddings, announced the opening of the court, called people into action, and heralded important events. 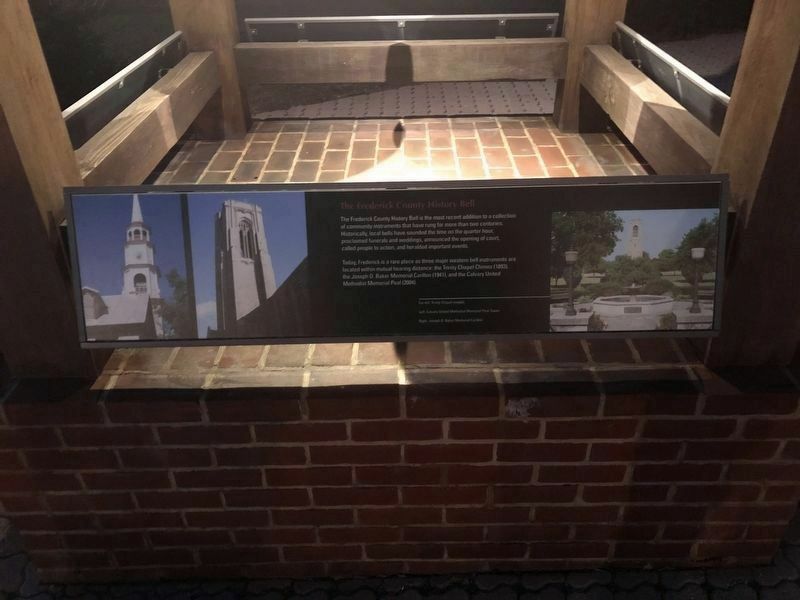 Today, Frederick is a rare place as three major western bell instruments are located within mutual hearing distance: the Trinity Chapel Chimes (1893), the Joseph D. Baker Memorial Carillon (1941), and the Calvary United Methodist Memorial Peal (2004). Bells are often heard across the hills and valleys of Frederick County and especially in the City of Frederick. 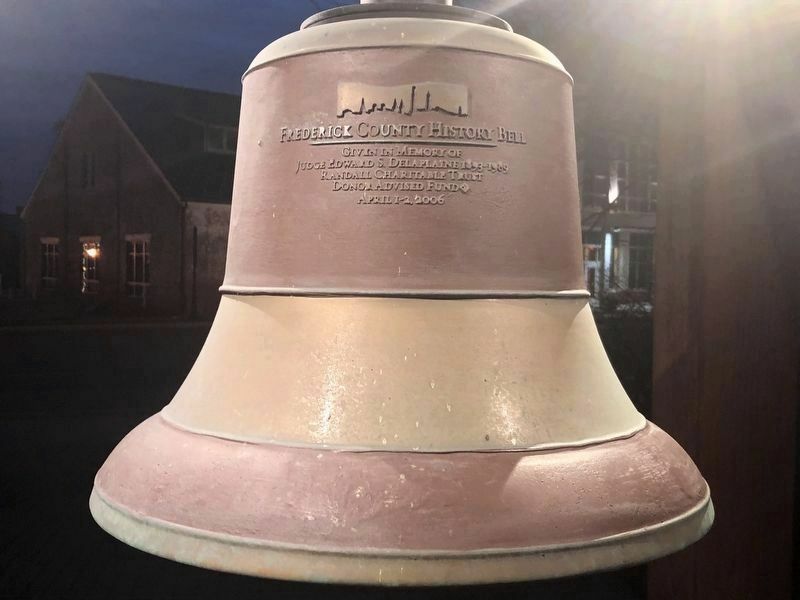 The Frederick County History Bell was added to our community's bells in 2006. Cast by the Verdin Company of Ohio using the world's only "traveling" bell forge, the bell is dedicated to Judge Edward S. Delaplaine (1893-1989), a local historian and descendent of John Thomas Schley (1712-1790), one of Frederick's founders. Local elected officials swing sledgehammers to crack open the mold and release the Frederick County History Bell. Foundry workers expose the unpolished bell. 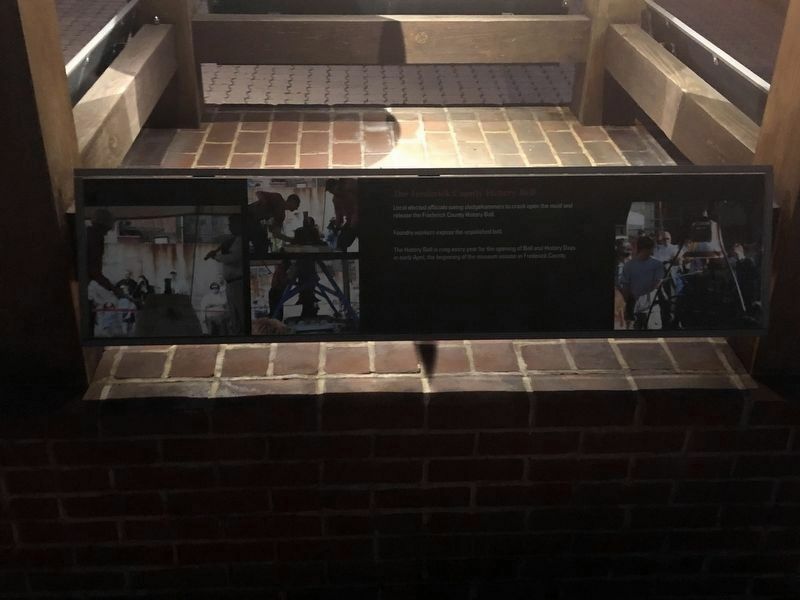 The History Bell is rung every year for the opening of Bell and History Days in early April, the beginning of the museum season in Frederick County. is in Frederick, Maryland, in Frederick County. Marker is on South East Street north of East South Street, on the left when traveling north. Touch for map. Marker is at or near this postal address: 151 South East Street, Frederick MD 21701, United States of America. Touch for directions. Other nearby markers. At least 8 other markers are within walking distance of this marker. Gen. Bradley T. Johnson (a few steps from this marker); The Frederick Brick Works (about 400 feet away, measured in a direct line); The Lower Depot Neighborhood / The Frederick Brick Works (about 400 feet away); Old Freight Depot (about 600 feet away); The Stinky Stuff (about 700 feet away); Civil War Hospital Center (approx. 0.2 miles away); Diehl Memorial Fountain (approx. 0.2 miles away); Frederick Town Barracks (approx. 0.2 miles away). Touch for a list and map of all markers in Frederick. Inscription can be found on the west side of the bell. More. Search the internet for The Frederick County History Bell. Credits. This page was last revised on March 19, 2019. This page originally submitted on February 9, 2019, by Devry Becker Jones of Washington, District of Columbia. This page has been viewed 53 times since then. Photos: 1, 2, 3, 4, 5, 6. submitted on February 9, 2019, by Devry Becker Jones of Washington, District of Columbia. • Bill Pfingsten was the editor who published this page.